Volume 13 | Bose | More Noise Reduction. Increased Mission Effectiveness. More Noise Reduction. Increased Mission Effectiveness. Missions get chaotic. There’s confusion, noise and tough conditions. With so much at stake, crews need to keep focused, on point and in control. They need a headset that will let them hear what matters – blocking out the noise, but making communications loud and clear. After 30 years of providing noise cancellation headsets to the military, Bose introduced the T5 Tactical Headset. The proprietary technologies make it the best military headset Bose has ever made, with an effective combination of active noise reduction, clear audio and a comfortable fit. 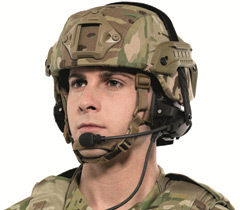 Military studies have shown that reducing noise improves effectiveness, and this headset is designed for active noise reduction, whatever the circumstances. With the T5 Tactical Headset, soldiers can filter out distractions, keep their focus and take command. The Bose® T5 Tactical Headset is designed to fit securely and comfortably under combat helmets. The field-replaceable ear cushions have a narrow profile and stay light and comfortable on long missions. The padded, stainless steel nape band keeps the headset snug and secure without being constricting. The nylon strap headband can be worn over or under the user’s helmet, so users can don their headsets and take them off without having to remove their helmets, too. This is equipment that gives soldiers comfort and convenience, making it a key part of success no matter what the mission throws at them. The headset is also intuitive in its communication designs and functions. It offers binaural talk-through that allows wearers to hear what’s going on around them and provides more situational awareness. With clear, two-­way communications through intercoms, radios and the talk-through feature, users will be able to talk to each other more easily through more systems. They will hear their orders loud and clear, and proceed with confidence and precision. The headset’s communication capabilities can allow it to be used for both mounted and dismounted operations. The single communication control module connects to vehicle intercoms, while the dual communication module allows simultaneous connection to, and operation with, soldier radios, smart phones, tablets and the UH60 helicopter intercom. Whatever the mission calls for – this is one piece of equipment that lets you own the situation. The T5 Tactical Headset also has remarkable noise reduction technology so communications during combat are loud and clear. The reduction of both continuous and impulse noise allows for increased focus on mission-critical tasks and information. It blocks out the noise of the chaos and keeps the user focused with the superior EMI performance, reducing audio interference from jammers and other electronic sources. The alkaline AA talk-through batteries are conveniently located on the cable-­mount controller module and provide approximately 40 hours of noise cancelling and 100 hours of talk-through only. Even when missions get long or require travel, the T5 Tactical headset keeps distractions out and the user in control. They can also take advantage of the noise reduction technology when the headset is plugged into a vehicular power source. All major subassemblies of the T5 Tactical Headset are field-replaceable, such as the proprietary dual-­use foam ear cushions and the cable/boom microphone assembly. The modular design allows for easy upgrades; and to support depot-level repair stations, Bose offers maintenance programs on request. It is qualified for use in all crew positions and variants of the HMMWV, MRAP, Stryker and more during full mission profile. With its ease of use and broad compatibility, the headset keeps the user in command of the situation. Built in the U.S.A., the Bose T5 Tactical Headset delivers a convenient comprehensive solution for comfort and practicality on all types of missions. Hear what you need to, and block out what you don’t. Take command and get greater situational awareness – request an audio demonstration today. Contact Bose for an onsite product demonstration.